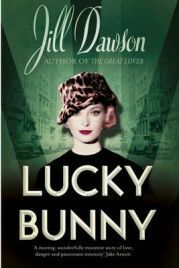 Lucky Bunny is fiction, but it is presented as the memoir of a female criminal, from her birth in 1933 to the 1960s. Queenie, as she has chosen to call herself, was born and brought up in London’s East End. Her life of crime starts with stealing some milk, then she moves into shoplifting as a child, often working with older family friends. With her mum in prison for life and her dad in and out, she is brought up largely by her grandmother and her dad’s girlfriends, most of them involved in various illegal activities. She is sent to an approved school, where she meets her best friend Stella, and later to a young offenders’ institution. Her beloved brother Bobby also starts early on a criminal career. She is no one’s victim, but a great survivor. Or is she? Is the title of the book accurate or ironic? I am not totally sure I can trust all of Queenie’s statements about herself. Is she really as lucky as she proclaims? I was fascinated by the way Dawson takes up so many bits of London’s social and women’s history as well as criminal folklore and spins them into a terrific yarn. I was amused by Queenie’s namedropping of lots of real people and events, including Ruth Ellis and Christine Keeler. She meets many of the famous, and infamous, Londoners of her day, and is witness to many real episodes in East End history. Queenie even suggests she might have been delivered at birth in 1933 by a young midwife called Jennifer, undertaking her training with the nuns, a reference to Jennifer Worth’s Call the Midwife. In fact, Worth wasn’t even born then and her book takes place more than 20 years later – is this a clue that some of Queenie’s encounters with other real people are also her inventions? I recommend Lucky Bunny as a very convincing historical novel and tale of a bright, adventurous and witty woman, and just want to know what the future held for Queenie, as the story ends in the mid 1960s when she is still only in her early 30s. I received a copy of this book through the Amazon Vine review programme. No Comments on "Lucky Bunny"